Made by JMG Instruments in Australia, Oceania, 1920S-1950S. Ukulele used by the Ardini vaudeville family. The body and neck of the ukulele are made of varnished wood with twelve metal frets fixed to the black lacquered neck. The headstock has four black plastic and metal tuning pegs and tuning knobs. A transfer label on the front of the headstock bears a makers logo with the text, 'JMG'. The body is shaped like a guitar with two strings, with two additional strings missing. The strings are attached to a metal tailpeice which is screwed to the bottom of the ukulele's body. A carved wooden bridge is located between the soundhole and tailpiece. Stamped at top of headstock '2988'. Transfer label on front of headstock bears makers logo, 'JMG'. Label linside body, 'MADE IN AUSTRALIA BY / JMG INSTRUMENTS / PATENT PENDING 2869 / 46'. The ukulele was made by JMG Instruments, Australia. It was possibly used between from 1920s and 1960, though the patent may date it to c. 1946. 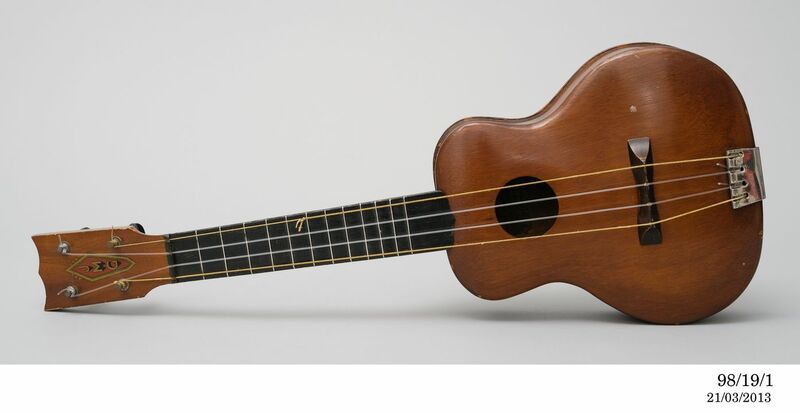 The ukulele was used by the Ardini family who were handbalancers and musicians who performed on the Australian vaudeville circuit between the 1920s and the 1950s.